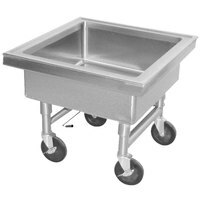 When you need extra room at your dishwashing station, mobile soaking sinks provide the tool you need to clean silverware, dishes, and kitchen utensils. 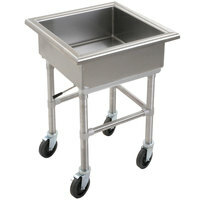 These portable soaking sinks provide a convenient, space-saving solution for soaking silverware prior to washing. 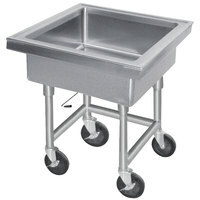 They can also serve as an additional utility sink, allowing you to maneuver it around the kitchen, laundry room, dishwashing room, or anywhere else you're looking to clean. 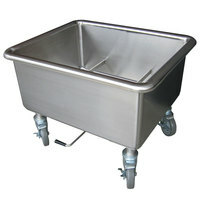 Made with stainless steel, these mobile soaking sinks are designed for durability with corrosive-resistant materials. 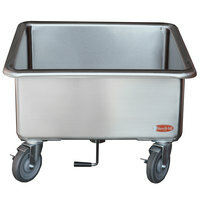 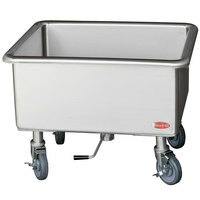 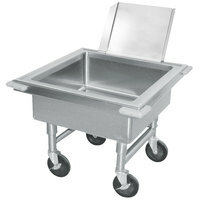 Swivel casters with locking mechanisms allow you to keep the sinks in place or easily move them where you need to work. 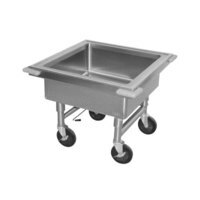 Additional options include a one-handed lever drain for water drainage, a detachable silverware chute to easily fill the sink with dirty silverware, and a curved rim that provides a bumper to cut down on hard collisions with doors and walls.